You are putting on pure style when you wear this one of a kind piece. 605650: Movado’s Swiss Men’s Watch is a highly fashionable watch. The white genuine lizard leather strap gives the watch a “bright as light” yet calming appearance all at the same time. Perfect to dress up for a night out or add just the right accessory for a day at work. It is simply excellence in design. The white on white look is just one of the many reasons why this watch has helped Movado earn international awards for innovation and artistry in watch design and time technology. 605650: Movado’s Swiss Men’s Watch is Swiss made with Swiss quartz movement. It also features a highly scratch resistant sapphire crystal, keeping it looking brand new year after year of wear. 605650: Movado’s Swiss Men’s Watch is water resistance to 100 feet or 30 meters. Wouldn’t recommend going for a swim with it on, but if you live in a rainy city you’ll be just fine. The white dial face includes the signature single dot mark at the 12 o’clock position and two silver hands. It is 38mm in diameter and 6.5mm thick with a band width of 21mm. This Movado Museum Men’s Watch is priced at an affordable $595.00. It has the Movado manufacturer limited two-year warranty and is available at authorized Movado sellers. Interesting approach via the artistic angle – this is a very unique timepiece, and I noticed the focus to reside on the product’s aesthetic merit. 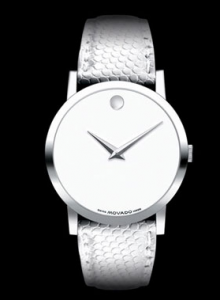 We all know that Movado is quality – but what class!